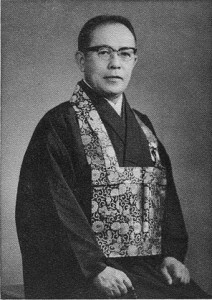 Dharma Master Rev Dr Sōyū Matsuoka-Roshi (Zengaku Sōyū Daioshō, 1912-1997) is the spiritual grandfather of the Southwind Sangha Sōtō Zen Association. He was a Gondai-kyoshi (Bishop) of the Sōtō Zen School, and served as Superintendent and Abbot of the Long Beach Zen Buddhist Temple and Zen Center. The temple was headquarters to Zen Centers in Atlanta, Chicago, Los Angeles, Seattle, Everett, Washington, and Orange County in California. Rev Matsuoka Rōshi was born in Japan into a family which has a history of Zen priests dating back hundreds of years. After he graduated from Komazawa University, Rōshi spent several years at Sōji-ji Monastery. He then was assigned a mission of establishing a temple at Karafuto Prefecture (Sakhalin), in the northern part of Japan. Matsuoka Rōshi then received a special assignment to the United States, where he served as a Zen priest in the Los Angeles and San Francisco Zen Temples. While in America he furthered his academic studies by pursuing graduate work at Columbia University with Dr D.T. Suzuki. Rōshi then established the Chicago Zen Buddhist Temple, the first Zen Temple in the Midwestern states. This establishment still operates under the dharma heirs of Rev Matsuoka Rōshi. Rev Zenkai Taiun Elliston Rōshi, Founder and Abbot of the Atlanta Sōtō Zen Center, met and trained under Rev Matsuoka Rōshi at the Chicago Temple in the 1960s. 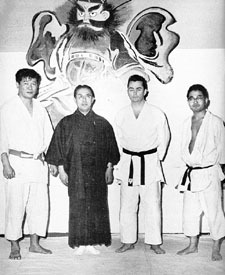 The ASZC was founded in the early 1970s with the support and guidance of Rev Matsuoka Rōshi. The ASZC and its affiliates continue to serve its diverse sangha with a rich schedule of instruction and events in the spirit of Rev Matsuoka Rōshi. Besides managing the temple in Chicago, Matsuoka Rōshi undertook many various activities. He conducted zazen for the students of the Chicago Jūdō-Karate School and was registered at the Chicago Central YMCA as a special instructor in Japanese culture and its relation to Zen Buddhism. In addition, Matsuoka Rōshi lectured intensively throughout the United States and abroad. This included an eight-month tour of Japan, which was sponsored by the American Embassy to Japan. On this tour he spoke about the “Unknown America” to groups all over Japan. In August of 1971, Matsuoka Rōshi established the Zen Center of Long Beach (Zen Buddhist Temple), where he served as superintendent until ill-health forced his retirement in 1995. During his career, Rōshi helped thousands of people take their first steps on the Dharma path. Matsuoka Rōshi’s writings and talks have been published in both hardcover and softbound: The Kyōsaku and Moku-Rai. Both can be ordered online at Lulu. To view the entire lineage of the Southwind Sangha, beginning with the historical Buddhas, then to India, China, Japan, and the United States, click here.